All workshops require enrollment in advance. Information and registration forms will be mailed out to members on April 25, 2019. Registration opens May 25, 2019. Envelopes may not be postmarked earlier than May 25, 2019. ​Classes will be filled on a first-come, first-serve basis, based on postmark date. A part two will be added again this year depending on interest. Cost - $30 per WOW member, $55 non-members. If a non- member wishes to join WOW, the additional $25 will go toward membership through 2019. • provide beginner watercolorists with basic information that will speed up their learning curve and set them up for success. • provide a review of watercolor basics for painters who would like to revisit them. • mixing colors from a limited palette - 3 different ways! Supplies: NOTE, the club will provide a small kit to those who are new to watercolor and have never taken this class. It will include one #12 brush, one sheet of Arches wc paper, a small palette and some paint. Students who are not new to wc should bring their own brushes, paint and paper, as listed below. 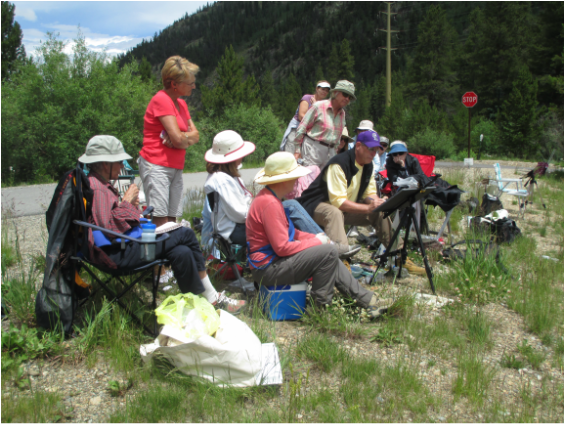 We will offer two Plein Air painting classes in 2019: one in June and one in July, see below. You can sign up for both classes or you can choose one of them. If you want to attend both classes, please note your first and second choice when you send in your registration form in May. Each class is limited to max 12 students. improve our paintings. A painting that has fewer shapes will attract viewers. connect shapes. Color and edges are all part of attracting viewers and buyers! You can sign up for as many mini-classes as you like. ​If you want to attend more than one class, please note order of preference when you send in your registration form in May. In this class we will learn how to prepare, paint, and finish 2, 3 inch slices of Aspen wood. so a small brush is needed, for example a size 4 round brush with a good point. The wood slices have a hole at the top for hanging as a Christmas ornament. Wood slices, and materials for preparation and finishing will be brought in. Color choices can be one of the most important decisions when creating a painting. mix color by limiting your palette and designing color with intention. How do you create the illusion of depth and distance in a landscape or still life? giving the viewer the illusion of a three-dimensional space on a two-dimensional surface. ​or a great review for many of you! Paper: bring several sheets of watercolor paper to practice on, approx. 9 x 12 is good. Or you can bring “old paintings” and work on the back. Drawing paper for practice sketches- 9 x 12 approx. I will bring photos for you to work from as well. away from “reality’” ...so bring several sheets of watercolor paper! And also bring your regular watercolor supplies! ​This was one day of a three-day workshop that he conducted for WOW. 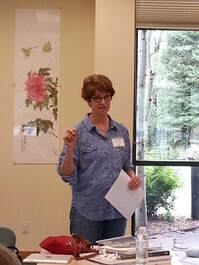 Sarah Bracco conducts a Mini Class for the Women of Watercolor. Members will register for all mini classes through the registrar. Classes will be filled based on the postmark date. Waiting lists will be compiled for classes that have more registrations than the 12 slots available. No walk ins will be allowed in classes. No one can ask an instructor if they can attend a class. If a member is unable to attend a class, she must notify the registrar that she is unable to attend the class. The registrar will then notify the first person on the waiting list of the class opening. That person will then send the required class fee to the treasurer. If there is no waiting list, the registrar will notify the membership of the class opening via an email alert. If a member does not show up for a class, she forfeits the class fee. If a member drops out of a class and the class is not full, she forfeits the class fee. If a member drops out of a class, but the class is filled, she gets a refund from the treasurer. If the instructor cancels the class and it is not rescheduled, members will be refunded class fees.